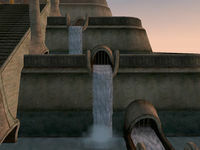 The Puzzle Canal, beneath the Palace of Vivec, is easy to get lost in, hence the term Puzzle Canal. To enter the Puzzle Canal, activate one of the water grates on the exterior of the Palace. Inside is one of the seven great shrines of the graces, where you must nearly drown to activate it. For more information see the Pilgrimages of the Seven Graces quest. The puzzle itself is not particularly complicated, and can be solved without too much hassle. There are 5 levels to the Puzzle Canals, numbered from 1 to 5 from the highest (and smallest) to the lowest (and largest), each of which is designed simply and has two doors to the north and two to the south. However, on the outside of the building, there are no doors on the south side. The northern exits take you exactly where you'd expect them to. Taking a southern exit from any of the canals will take you to a different level than where you came in from. 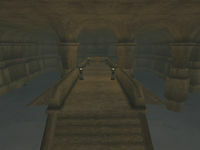 All you need be concerned about, however, is Level 3, because the entrance to the Puzzle Canal's center is there, in the connecting passageway. As long as you enter from the 3rd level on the outside, you don't need to worry about the other 4 levels (unless you really like rat meat). If you want to explore the levels in a step-wise fashion, you can use Levitate or Jump to go from Level 5 to Level 4, etc., on the outside. 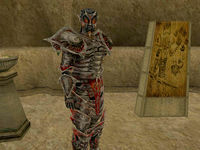 Sometimes, you will hear Vivec citizens talking about "hidden treasures" in the Puzzle Canal. Despite this, the only feature worth noting is the Shrine of Courtesy.